The history of Oliwa begins in the days of yore, when monks of the Cistercian Order established a monastery along the banks of the bubbling Oliwa Stream, in 1186. Two years later, the Duke of Pomerania bestowed (...we need more bestowing in the modern world!) special rights and privileges upon those faithful fellows. But those good times didn't last forever and in 1308 the Teutonic Order swept across the region and subjugated the local peoples. The monastery was destroyed by fire and, although it was rebuilt, Oliwa would become a site of violence and tension for centuries to follow. Wars fought amongst the Polish Kings, the Swedes, the Prussians, and the Russians would all extend into Oliwa and although the town shares Gdansk's independent spirit and nature, it would often become part of foreign ambitions. The protestant reformation, the Napoleonic Wars, and of course both World Wars would all leave their mark on the region, and despite it becoming a part of 'Free Gdansk,' such autonomy was short lived. In 1874, Oliwa was made an official city and today, despite it's proximity to Gdansk, it remains a distinct entity. Today Oliwa is best known for the Oliwa Cathedral, which houses a massive, awe-inspiring organ with over 7,500 pipes! 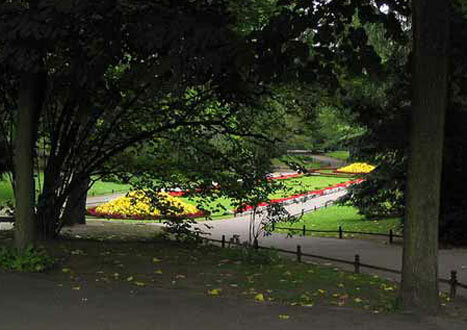 Also famous is the Abbot's Palace and the well maintained parks surrounding both buildings. To the residents of the Tri-City, Oliwa is known as a place of relative wealth and prosperity, home to some of the more well-to-do citizens. The forests of Oliwa provide the town with a bit of shelter from the hustle and bustle of Gdansk or Sopot and of course the beach is always just a few minutes away! There is a special stop on the train for Gdansk Oliwa, which makes it nice and easy to get to, but be warned - it's not so easy to leave! The cathedral alone...scratch that, the organ inside the cathedral, is reason enough to make a special effort to come here. So don't delay! I left Oliwa 40 years ago and did not have a chance to be back.. I miss Oliwa dearly and hope to be there and see Oliwa again. Oliwa is a beautiful city. This site is great.